Multi-layer microfluidic devices are easily prototyped at low cost utilizing Potomac’s digital fabrication toolbox that combines both new and existing manufacturing technologies. Multiple layers of the device are precisely aligned and bonded by using various available bonding technologies. Although the field of microfluidics emerged in the early 1980’s, applications of the novel technology have only recently gained momentum, especially in biotech. Now, microfluidic’s ability to manipulate and process highly controlled micro-samples is impacting drug discovery, typing of single nucleotide polymorphisms for genetically based drug prescription, fundamental genetics research, environmental analysis, point of care diagnostics, personalized medicine, and proteomics. 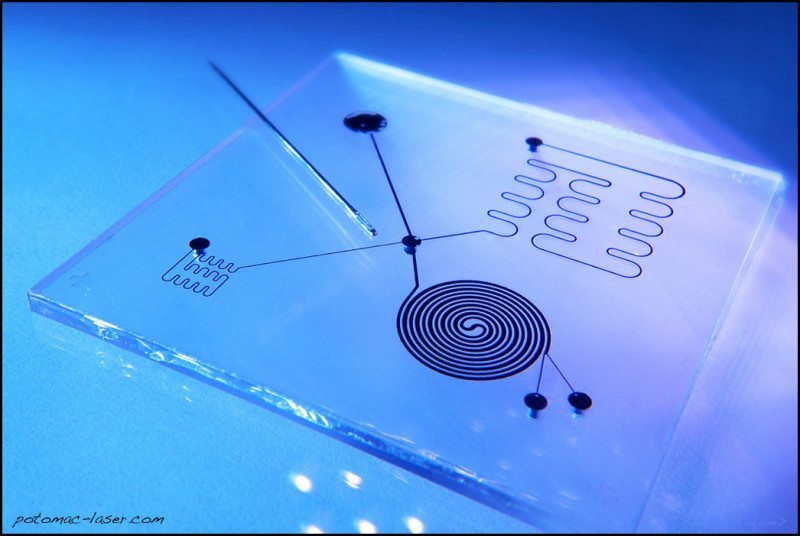 Microfluidics has been called “Lab on a Chip” for its ability to rapidly and economically perform analysis on tiny samples which previously required large machines to process large samples at high cost. The field is moving even farther to produce “Organ on a Chip” to assist the body when organs fail. These new microfluidic applications are amongst the greatest engineering challenges of the century since expertise is required in engineering, physics, biology, medicine, chemistry, and biotech. 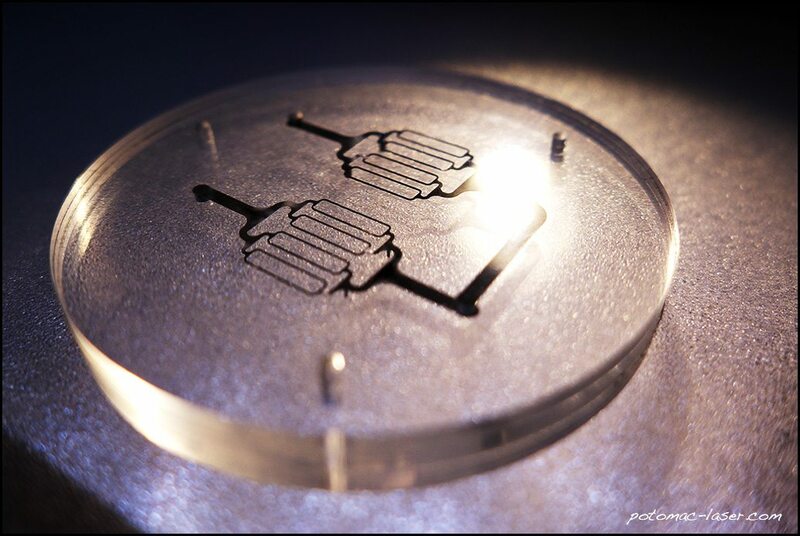 New device designs are at the forefront of microfluidics R&D, requiring rapid prototyping to test concepts in order to quickly bring new microfluidic-based products to market. 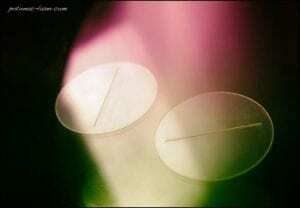 Laser cutting of PSA tapes for microfluidic applications. A typical microfluidic system consists of a fluid handling structure with miniature channels, wells, mixing structures, and connection ports that are coupled to external micropumps, microvalves, electronic modules, and similar actuation and analytical modules. Feature sizes can be as small as a few microns and channel width is often as small as 10 to 15 microns. With increasing design complexities of “lab-on-a-chip” systems, designers are now considering multi-layer configuration for microfluidic devices as an interesting option that can complete more number of analyses on the same footprint of a cover-sealed single layer device. The basic concept in these designs is that one or multiple analysis steps can be performed within each layer of the device, and different layers are inter-connected via small through-holes. Alignment and bonding of the layers are critical steps in the fabrication of multi-layer devices. Potomac has worked with microfluidic device experts to device fabrication methods specific to the multi-layer process. Combined with our expertise in micro-fabrication, we are able to integrate fabrication processes to rapidly prototype new microfluidic designs. Use of pressure sensitive adhesive (PSA) layers for bonding and sealing is the simplest and most cost-effective available technique. Adhesive bonding additionally offers simple integration of non-similar standard or even nonconventional materials in microfluidic applications. In this approach, the layers of medical grade adhesive materials are first precisely patterned with a UV laser to allow inter-connection between the device layers. These adhesive sheets are then aligned and laminated between the device layers. A final specialty post-processing step for PSA bonded chips is also followed to improve the bonding quality and strength. The adhesive sealing and bonding process is further simplified by the use of specially formulated, commercially-available adhesive tapes. Alternative bonding technologies, include solvent-assisted bonding, thermal bonding, and laser welding, depending on the materials and the constraints imposed by the final microfluidic application are possible. Micro-manufacturing processes such as laser micromachining, micro CNC machining and 3D Printing are all digital fabrication processes. A Computer Aided Design or CAD file instructs the tool on how to make the part. A significant benefit of CAD-based manufacturing is the ability to change designs and with no tooling or mold costs, produce a new part at low cost and in a short amount of time. In short, multi-layer microfluidic devices are easily prototyped at low cost utilizing Potomac’s digital fabrication toolbox that combines both new and existing manufacturing technologies.